Winston-Salem, NC (December 19, 2012) This holiday season, once you’ve unwrapped your latest high-tech gadget, treat yourself to the app that keeps on giving. In the year since its December 19, 2011 launch, over 230,000 Krispy Kreme® doughnut and coffee lovers have downloaded the FREE, award-winning Krispy Kreme Hot Light App™ , and conducted over 42 million searches for hot doughnuts and cool promotions from nearby Krispy Kreme locations. Download the latest version of the Hot Light App for FREE at HotLightApp.com. Available in US markets only. Not available in Puerto Rico. Along with Hot Light alerts, Hot Light app users are among the first to know about upcoming promotions and featured limited time offerings, and you can use your mobile devices to seek out a nearby Krispy Kreme when traveling throughout the United States. Here is a sweet tidbit about the Hot Light App: The Top Ten Markets Using the Hot Light App to find Hot Doughnuts Now®! 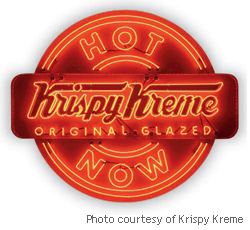 The Krispy Kreme Hot Light App can be downloaded for iPad, iPhone and Android phones for free at HotLightApp.com. Only available in the United States. Excludes Puerto Rico and US Territories. Krispy Kreme® is an international retailer of premium-quality sweet treats, including its signature Original Glazed® doughnut. Headquartered in Winston-Salem, N.C., the Company has offered the highest-quality doughnuts and great-tasting coffee since it was founded in 1937. Today, Krispy Kreme can be found in approximately 730 locations around the world and approximately 10,000 grocery, convenience and mass merchant stores in the U.S. Krispy Kreme Doughnuts, Inc. (NYSE: KKD) is listed on the New York Stock Exchange. Visit us at www.KrispyKreme.com.